One of my favorite things about some of the monthly quilting groups that I belong to is the show & tell time. I love seeing what everyone is working on, and I’m often inspired to create something based on what has been shared. Here on my blog, I often share my progress of BOM projects, quilts that I’m working on, and other various projects. So today, I have a little show & tell for you! 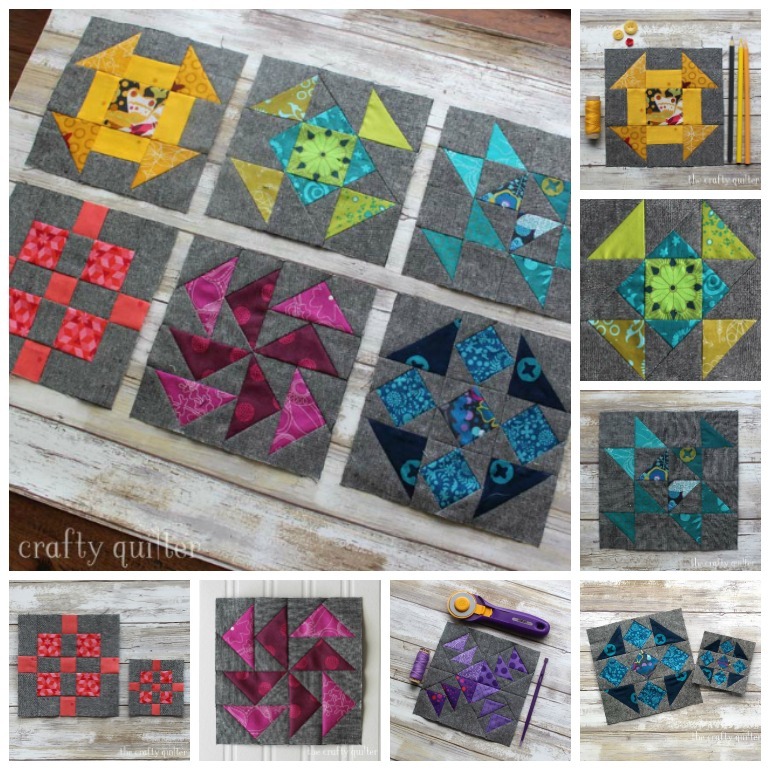 I am a sucker for a good block of the month or sew along, so I have many that I’m participating in – both online and in person. 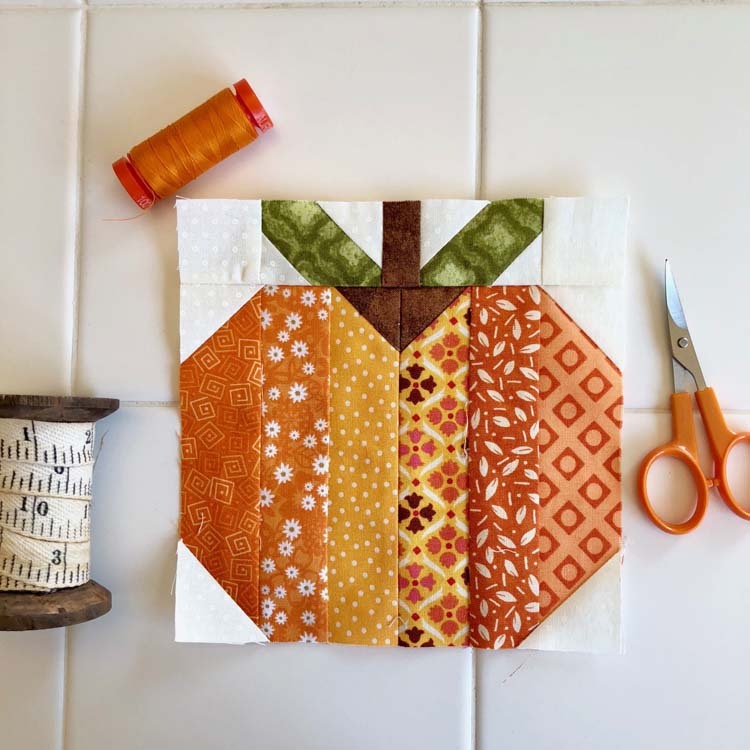 I’m sewing along with Amanda at The Patchsmith and her Patchsmith Sampler Sew Along. 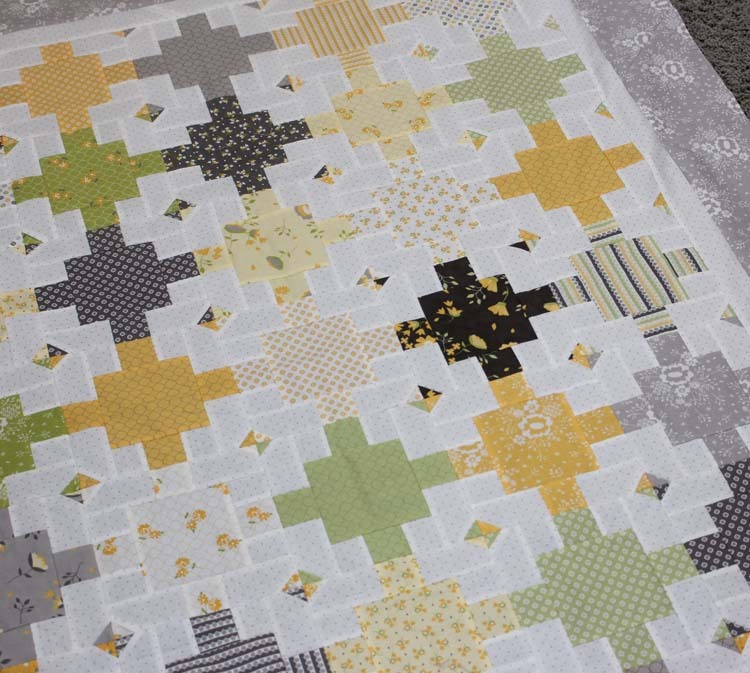 There are a total of 50 (6″) blocks in this weekly sew along, and we’re already up to number 23! I’ve missed a few blocks, but here are blocks 19 (Everyway), 20 (Pumpkin), and 22 (Spinning Churn Dash). Aren’t they adorable? Amanda’s instructions are excellent and I love the variety. 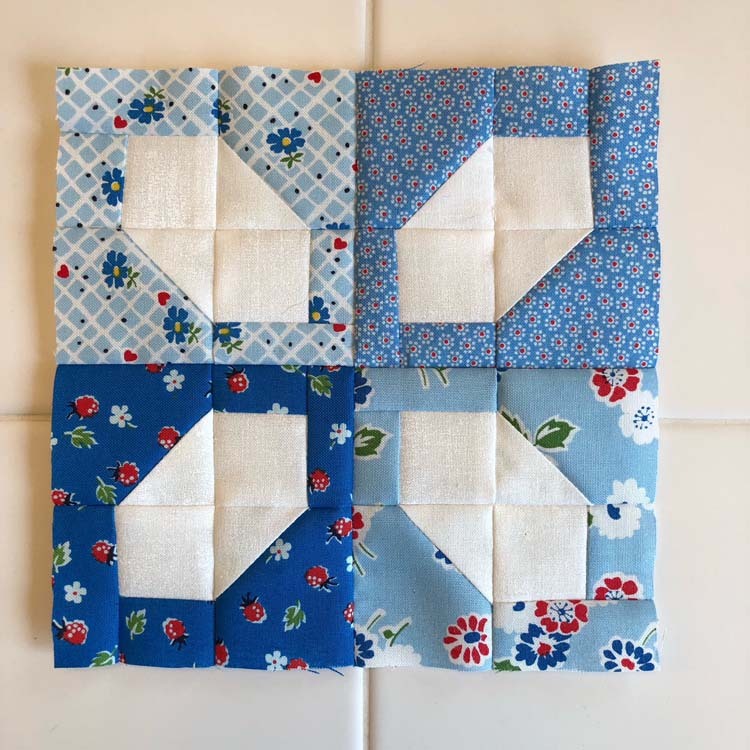 Her book, The Patchsmith’s Sampler Blocks, is available on Amazon (affiliate link). 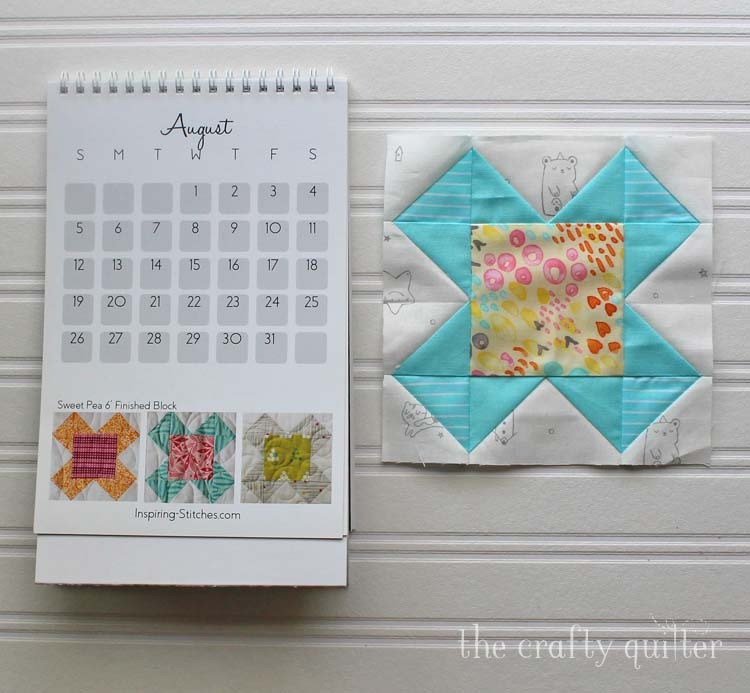 I am making smaller versions of the Quilter’s Planner Block of the Month blocks. The instructions are written to finish at 12″ square. My blocks are both 6″ and 3″ finished. Yes, I’m making two for each month, and the blocks for July were the hardest yet. I had to draw them on graph paper at the exact size I wanted (finished) and then measure the size of each flying geese to come up with the correct cutting measurements. The smaller, 3″ block has flying geese that measure 1/2″ x 1″ finished. Yikes! But so gratifying when they are perfectly complete! The Heartland Heritage block for August is the Sweet Pea block. This 6″ block was easy to put together. I am planning on this becoming a baby quilt when I’m done. Pretty sweet, huh? I’m co-teaching the Vintage Sampler BOM at my local quilt shop and I’m having a hard time keeping up with my own class! One of the most recent blocks is this “Square and a half” block. I really like the design – the center of this block is an Ohio Star. 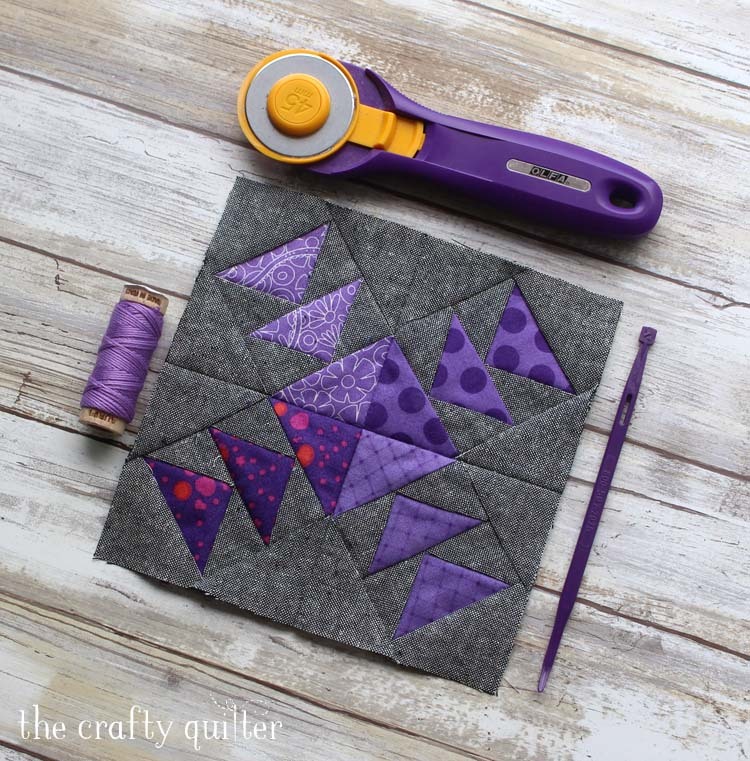 I have a great tutorial on how to make those quarter square triangles for that block here. That tutorial has been one of my post pinned blog posts! 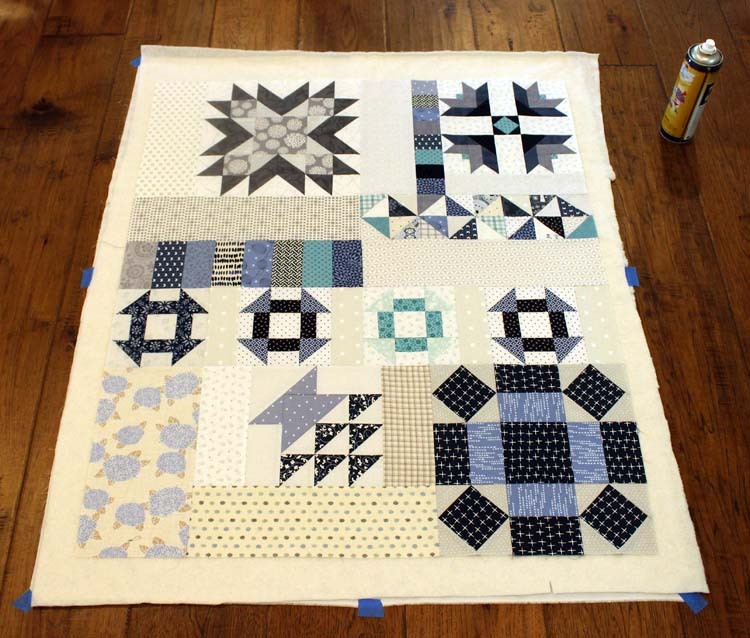 This sampler quilt has a lot of variety and it’s being put together in sections. I have the first section finished. 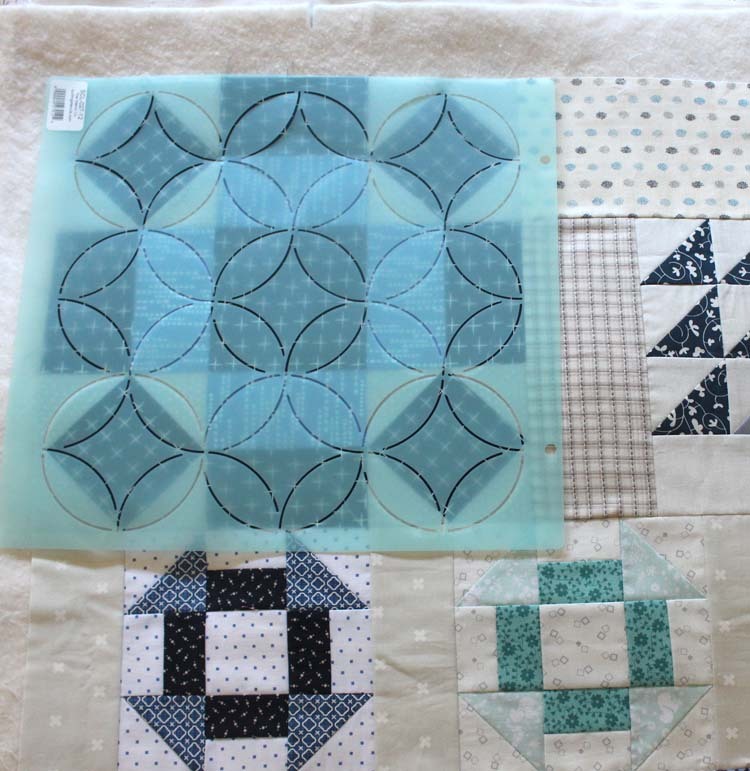 I’m going to quilt each section individually and then put them all together with sashing strips. I’ll provide a detailed description of that process when I get to it in November or December. Right now I have my section basted and I’m auditioning some quilt stencils to use for the quilting. 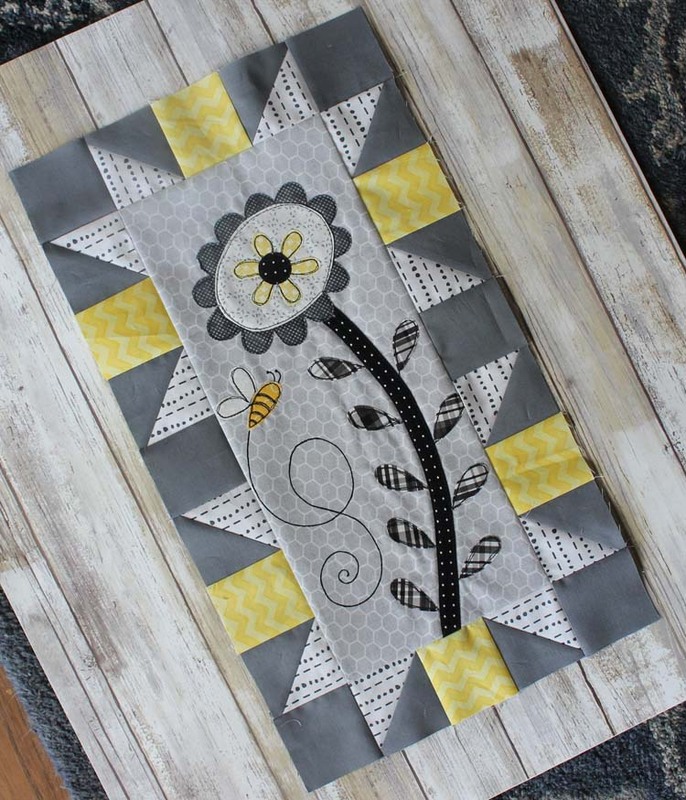 If you want more information about using stencils with quilting, check out this blog post. And finally, I have a quilt top finished! 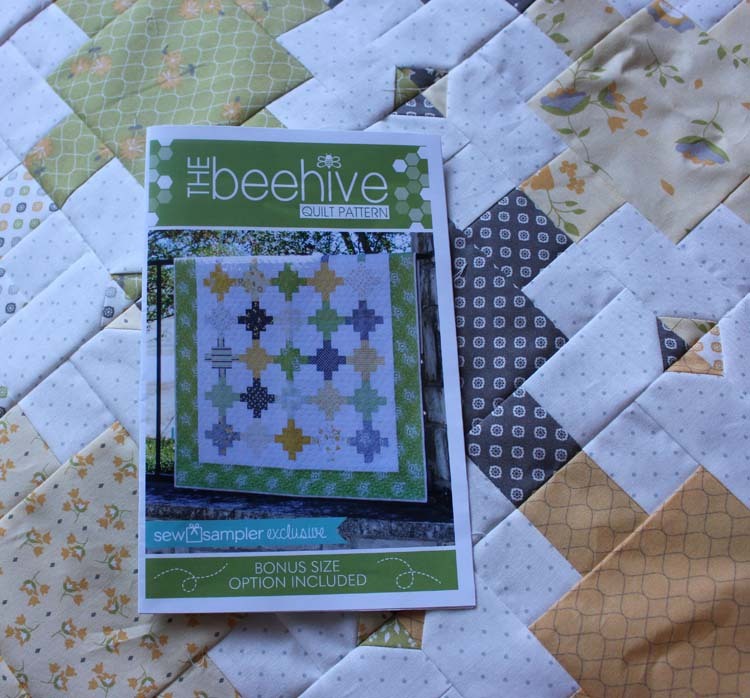 This pattern is called Bee Hive and I’m using one of my current favorite fabric lines, Pepper & Flax by Corey Yoder for Moda. 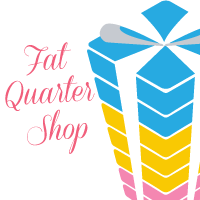 The pattern and fabric (Jolly Bar) were included in May’s Sew Sampler Subscription Quilting Box from Fat Quarter Shop. I love getting one of these boxes in the mail each month! I changed the pattern just a tiny bit. I had leftover scraps from my fabric, so I cut 1 1/4″ squares and added corner triangles to each block. I like how it turned out. Now it’s off to the quilter! I will begin the next Save The Bees block this weekend. I really appreciate all of your wonderful comments from the first block. When I do giveaways, I’m unable to respond to each comment because there are so many. I DO read each comment and who its from. I see a lot of familiar names and many new ones. 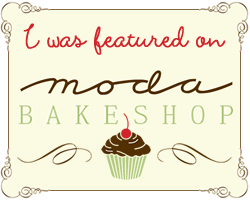 Welcome to my blog if you’re a new follower, and thank you for allowing me into your media space! While reading the comments, I noticed that you seemed to really like my fabric choices and I’m so glad to hear that! They’re all from my stash – so it’s a mixture of old and new. Also, I asked what quilt size you make the most of. 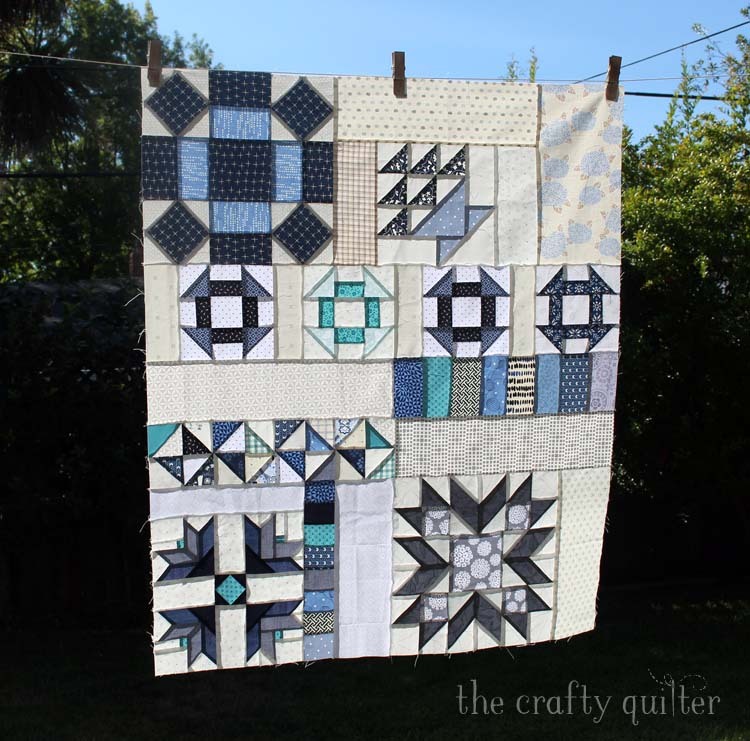 I see that a lot of us quilters like to make smaller quilts so that we can move on to the next one! And there were many of you that like to make larger, bed-sized quilts. They are so useful! And sometimes it’s “whatever size I’m currently working on” that’s your favorite. For me, I like to work with smaller projects. I like that I can quilt them myself, make them quickly, give them as gifts and learn new techniques in a short time span. However, I’m always happy when I conquer a larger quilt and that could be a large throw size or a queen size quilt. I still have yet to complete a king size quilt, but it’s on my bucket list! You still have time (until Sunday, 8/12/18) to enter the giveaway for a copy of the Splendid Sampler. Go to my Save The Bees Month 1 to enter. I hope you’re having a wonderful week and tackling your own bucket list! Hi Julie! 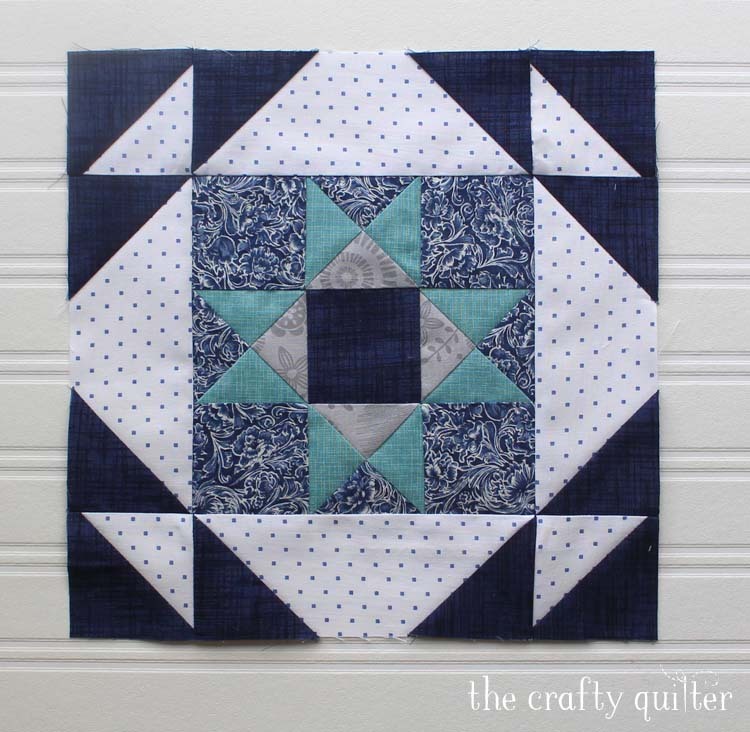 I have been sewing since I was twelve and began dabbling in quilting in my mid twenties. Georgia Bonesteel was my quilting idol at the time and machine quilting was a sacrilege. LOL! How times have changed!! 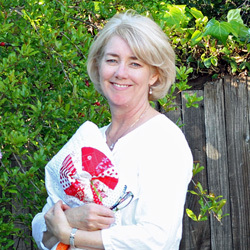 As life happens, I soon went from a stay at home Mom to a full time corporate employee and my ventures in quilting were laid aside until my husband and I retired last fall. Since then I have been focusing on small projects to hone my skills and teach me different techniques. Your blog is a continual inspiration and invaluable resource in those endeavors. Many thanks! I really like your fabric selection. The grays are excellent. Yes….I’ve been sewing since I was 6….quilting for the past 25 years or so….off and on but mostly on. Can I buy the Bee Hive pattern you showed us? I bought Pepper and Flax fabric and loved your quilt. 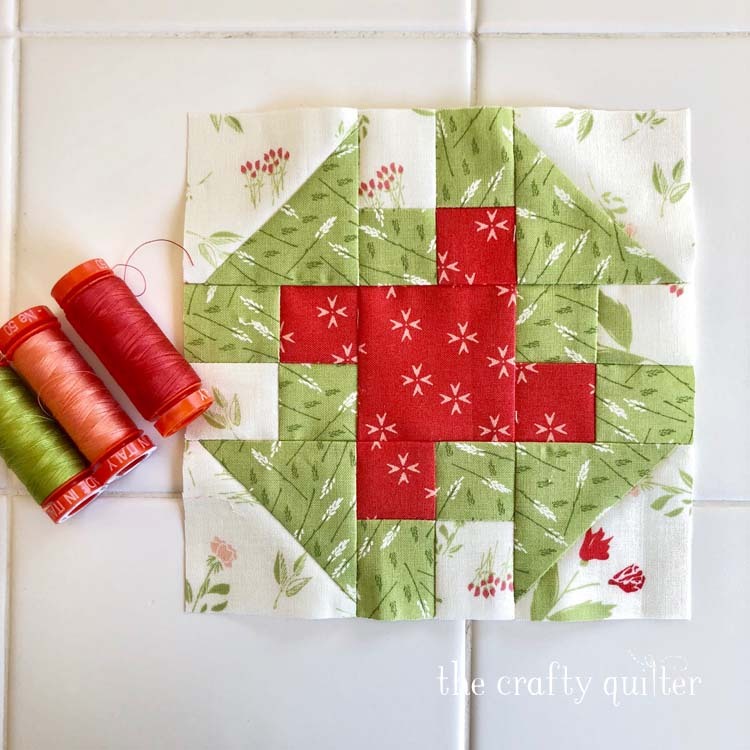 Hi Julie, I’m still following and loving your blog, but don’t really do quilting in the summer so never get into any of your tips etc! 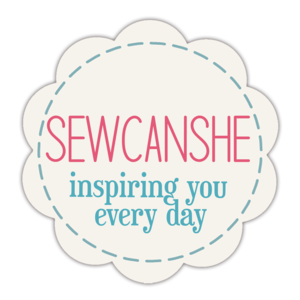 I did haul my machine onto the veranda with great ideas of starting some serious sewing, but it’s been too hot! Yes even in Norway! We’ve had 3 months with no rain and July was 25-31c so my days have been spent watering my flowers , tomatoes and cucumbers and swimming. Now we are enjoying more sun on our vacation in Italy. But have time to leave a comment on your lovely quilt tops. 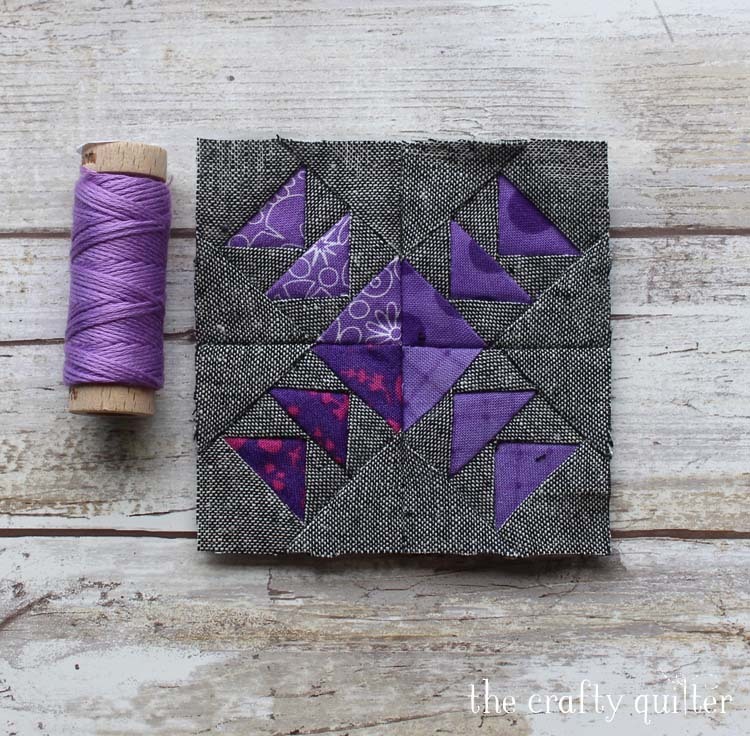 I like the idea of quilting in segments and joining with sashing, and your colours are all lovely! Some of your blocks are so small I don’t know how you get them looking so perfect. 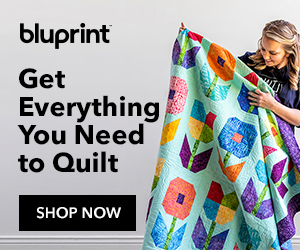 Enjoy your summer of quilting. 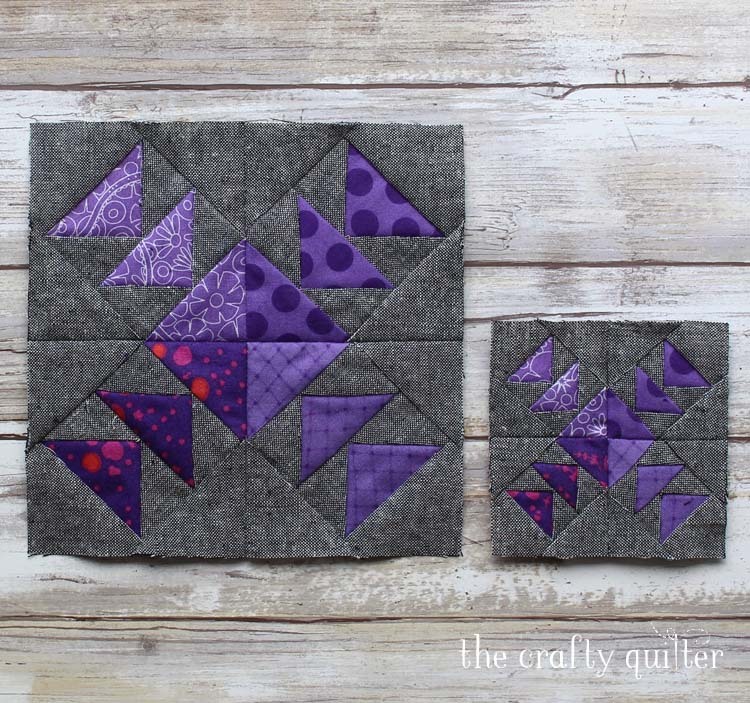 Your blocks all look great, but that quilter’s planner block that finished at 3″, that is just crazy! I love it! Julie your blocks are so pretty! 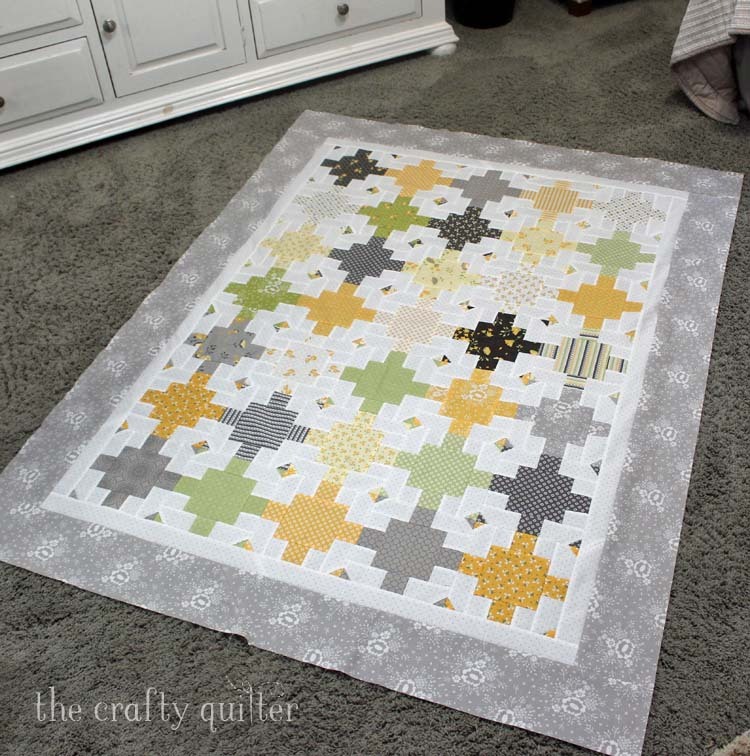 I couldn’t get over resizing those tiny flying geese block. The colors look amazing with that grey linen. I also like the Patchwork ones, especially the pumpkin; they are adorable. You sure are a busy, busy lady! I don’t know how you do it but I love seeing all your beautiful works of art. Amazing blog. Thank you, Julia. I open the mail, so much to learn from, so many beautiful fabrics, such good taste in combining the colours, wish I lived in the U.S. and had access to some of the BOM! Cheers! I enjoyed the information you have given in this posting. I’m kind of self-taught as far as stencil and ruler work, so I appreciate seeing what you are doing. Thank you.